Are SMEs ready for compensation scrutiny? In 2008, CCBE undertook an initial ‘environmental scan’ of SME governance in Canada. Using the criteria for our Board Shareholder Confidence Index (BSCI), we rated 100 SMEs and determined that their adoption of governance best practices was at the same level as the TSX Index in 2002. In other words, SMEs were 5 years behind, so to speak. Since then, we have developed a customized SME scoring scheme with criteria designed to touch on challenges facing SME boards and executives. In some cases, there is still overlap with our BSCI criteria for the large-cap TSX Index. The chart below shows our SME sample set in blue (n=113) scored based on our SME criteria, and the TSX Index in red (n=199) scored based on our BSCI. 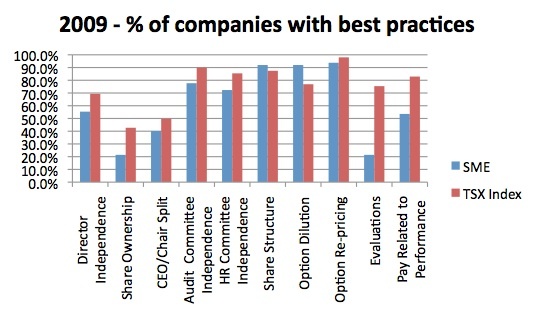 This comparison shows that adoption of best practices is now very close between the two groups. There remains a gap in three key areas: director share ownership, board evaluations and CEO pay related to performance. This indicates that while improvements have been made by SME boards in structural areas (director independence, committee independence, CEO/Chair split, etc. ), there is still much room for improvement in board decision-making and oversight. Large-cap corporations have experienced a significant increase in investor scrutiny, particularly related to executive and director compensation. It isn’t much of a stretch to assume SMEs will begin to feel pressure to catch up.